Brinsworh Whitehill Under 11s are looking for one more outfield player, preferably a Midfielder, to complete our squad as we move to 9v9 format. We are holding open trials on Friday 28th July at 6pm at the Phonix Sports and Social Club, Bawtry Road, S60 5PA. Players must not be registered with any other team for the upcoming season and should be in school year Y6 in September. Please contact Ben Harris Shaw, team manager, on 07955 596627 if you would like to attend. Brinsworth Whitehill Girls have announced a fantastic new partnership in conjunction with Rotherham United Ladies Football Club which means they now have a new name, Rotherham United Whitehill Girls Football Club and this should provide both clubs great opportunities to develop girls football in the area. Rotherham United have received funding to attend schools and coach girls in the local area and Whitehill will then help in organising teams for new players. 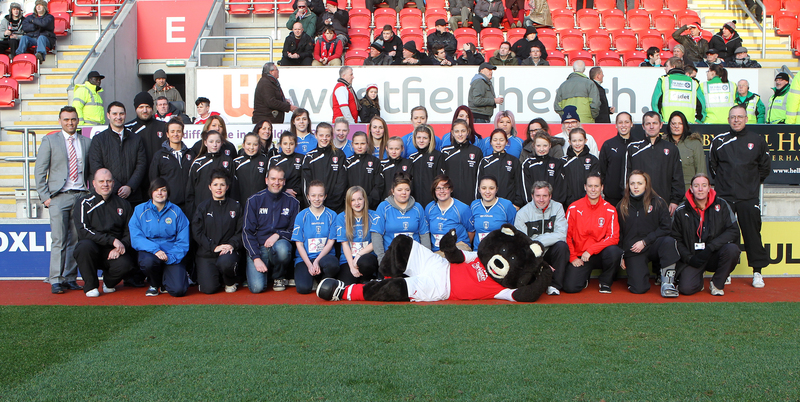 The initiative was launched at the Rotherham United v Wolves game and pictured below are players and managers from RUWGFC teams along with Rotherham United Ladies. Any one interested in joining a team please contact Lee Cardwell for further info. Please note players must not be registered with any other teams in the SHGCL. See Rotherham United F.C. to find out more.